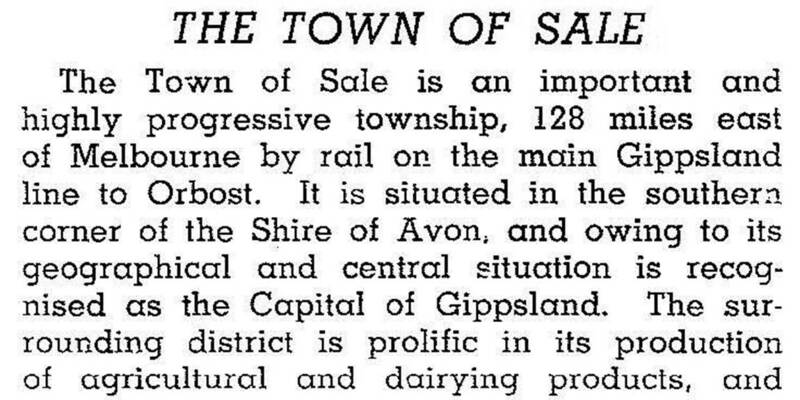 Sale, the largest city in central Gippsland, got a substantial fillip after the discovery of oil and gas in Bass Strait in 1965. Esso built classy homes for its executives and senior engineers while the Victorian Government’s Housing Commission built houses for the everyday workers. An early beneficiary of the Omeo gold rush in the mid-1850s, its future still depends on extractive industries. It retains a number of rather grand heritage hotels, but its railway station has been relocated to the outskirts, robbing the city of its former country town feel. Sale is 20 km west of the Gippsland lakes and 195 south-east of Melbourne. It is north of the junction of the Latrobe and Thomson Rivers which enters into Lake Wellington, a factor which greatly influenced Sale’s early growth. Nearer to the town there is Flooding Creek and various wetlands and morasses. Pastoral runs were taken up around Flooding Creek in the 1840s, the most prominent one being The Heart, of 30,000 acres which enclosed the future town of Sale. Gippsland trade operated through Port Albert and travellers paused at any of the numerous morasses or made for a shallow ford on Flooding Creek south of today’s shopping centre at Sale. In the mid-1840s a blacksmith’s forge and an inn opened at Flooding Creek, and in 1848 a town settlement was surveyed, comprising the two blocks bounded by Raymond Street, MacAlister Street, York Street (present highway) and McMillan Street. Town lots were sold in 1850, and the name was changed to Sale to commemorate an Afghan war hero, General Sir Robert Sale, who was killed in battle in 1845. Outside Sale the Presbyterian and Moravian Ramahyuck Mission was established on the Avon River at Lake Wellington in 1863 as one of seven Aboriginal reserves in the colony. When Ramahyuck was closed in 1908 its school and orphanage were pulled down. Trade through Sale increased with the mining of gold at Omeo from the mid-1850s, and regular use was made by shipping of the recurrent opening from Bass Strait into the Gippsland lakes and the Thomson River to an emergent port at Sale. In the 1880s a canal was made from the Thomson River to a swing basin waterway south of Pearson Street, putting shipping traffic right at the edge of the town. The project went in the face of the recently opened Gippsland railway (1878) from Sale to Oakleigh, which was only ten miles south-east of Melbourne. Early institutions in Sale included a Presbyterian church (1854), the Club Hotel (1858) in Foster Street and a mechanics’ institute (1862) also in Foster Street. The Gippsland Times began publication in 1861. The 1860s were a decade of consolidation. Sale borough was proclaimed in 1863, a court house was built in 1864 and the grand Criterion Hotel (1865) was built at the corner of MacAlister and York Streets. East of the town a swampy area was reserved for a botanic garden, and a hospital (1867) was built north of the reserve. Cobb and Co had a coach service between Melbourne and Sale. Its former stables (1879) stand at 199 Raymond Street. Although Gippsland did not become an important port, it nevertheless became a regional capital. Both the Anglican and Catholic churches built large churches and a convent, the Anglican one being designated a cathedral in 1902. The colonial post office constructed a grand building with a clock tower in 1884. (Although the clock tower was demolished in 1963, a replica was put in the shopping mall in 1988). Law and order enlarged the court facilities to serve as a Supreme Court in 1889, with the wise precaution of building a H.M. Prison two years earlier so that felons could be safely sentenced. Education was attended to. A new mechanics’ institute (1891) in York Street housed a school of mines, art and technology, until the school was given its own building. The Catholic church built a large convent (1892-1901) to the north of the town. State secondary schools took tentative steps with agricultural high schools, and one was opened in Sale in 1907, sharing space with a technical school in the mechanics’ institute. It got its own building in 1916. Six years later the Catholic St Patrick’s college opened. In the 1920s closer settlement farms were created around Sale, bringing more trade; the shopping precinct became established in Raymond Street, along with some prominent bank and business premises. Sale was upgraded to ‘town’ status in 1924. 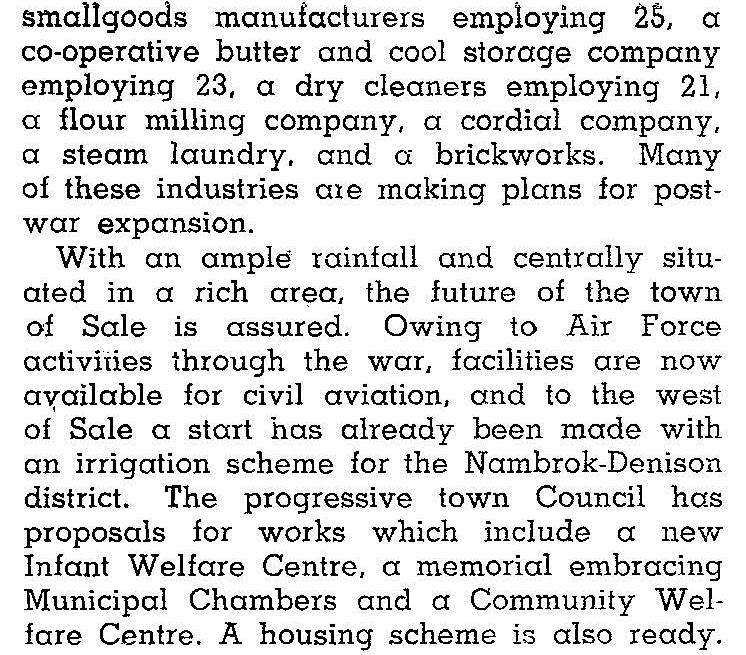 Even in the economic doldrums of the 1930s there were town improvements. The botanic gardens were substantially completed with Lake Guthridge, and King George V Jubilee Avenue was planted along York Street. A Coles’ variety store opened in 1938. St Patrick’s College and St Anne’s Church of England Girls Grammar School were founded in the 1920s. Housing continued to be in short supply after the war, as Sale’s population expanded with the postwar baby boom, postwar migration program and the need for defence force housing as the East Sale RAAF base became a permanent fixture in Sale. Sale was declared a city in 1950, as new housing subdivisions spread over the town’s boundaries into the neighbouring shire. The discovery of oil and gas in Bass Strait in 1965 dramatically changed Sale’s image. Since its early days the town had served as a regional centre, supplying the pastoral and dairy industries, and acting as a transport, educational, legal, commercial and administrative centre. In 1965, when Esso established its on-shore operations in the town, Sale became a mining frontier. New estates with executive homes were built by Esso and private developers. The Housing Commission built homes to help satisfy the acute shortage of houses caused by the influx of workers for the oil and gas industries. New primary schools were built in the growth areas, (Gutheridge primary, 1961 and Arulen primary, 1971) and the six secondary schools expanded. The older residential areas were given a facelift. An extensive redevelopment transformed the original grid into courts and crescents, with only the main streets remaining as thoroughfares. Sale’s shopping precinct was also redesigned, with a pedestrian mall featuring a copy of the old post office clock tower. Sale railway station was relocated from the heart of the shopping centre to the outskirts of town and sporting facilities were overhauled. However, in 1994 Esso’s on-shore activities were transferred to Melbourne, causing some dislocation in the town. The construction and operation of a new prison at east Sale, offered new employment opportunities. With the reorganisation of local government, Sale became the administrative seat for the newly formed Shire of Wellington. A feature of Sale is Lake Guthridge and nearby the Sale Common, a wetland of national significance, accessible by boardwalks. There are a racecourse, showground and greyhound race track north of the town, and the golf course is to the south. Planning for a new greyhound racing complex on a 44 hectare property on the northern side of the Sale Maffra Road, about 300 metres from the current site, was underway by 2014. The six secondary school campuses are grouped as: State, Gutheridge junior campus and MacAlister senior campus on the former technical school site; Anglican, senior Grammar campus and junior campus on former St Anne’s site; Catholic, Sion senior campus and St Patrick’s junior campus. Sale has a regional art gallery. The Sale campus of Community College Gippsland closed in 2014.